The present Survey is the twelfth in a series of reports prepared each year by the secretariat of the Economic Commission for Asia and the Far East. 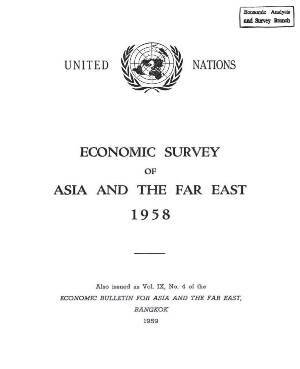 A major object of these Surveys, and of the quarterly Economic Bulletins which supplement them, is the analysis of recent economic developments in, and affecting, the countries of Asia and the Far East in so far as these developments are shaped by, and help to determine, their policies. Following the usual pattern, Part I of the present report gives a preliminary view of the economic situation in the ECAFE region in 1958. Part II is devoted to a review of postwar industrialization in the region — the efforts towards industrialization, the growth and structure of industry, the development of selected industries (coal, cement, cotton textiles and chemical fertilizers) and the relations between industrial growth and economic development.